As I walked through the misty air of El Yunque, I hiked to the top of the mountain that rises over 3,500 feet above sea level, known as El Toro Trail. The steep terrain and wet climate, surrounded by a wild and abundant vegetation, transported me to another world where everything seemed so small and far away. I started with my daughter and nieces at Big Tree Trail, contemplating some of the trees that grow up to 125 feet tall with roots over 200 years old. When Hurricane Hugo hit the rainforest in 1989, it changed its course, causing the storm to miss the northwest of the island. Even though the robust and violent winds destroyed most of the woodland of El Yunque, the Tabonuco trees best resisted the hurricane. I observed the roots of the enormous trees, admiring its incredible force and remembering when my strength was tested. Just a few years ago I was a spouse, a retailer, a successful business owner and in my small life, I was content. I realized how much I took for granted because my life unexpectedly turned upside down, and the harder I tried to shift things around, the worse the struggles became. Losses were striking me one by one. Simultaneously, my marriage ended, I was forced to close my store, losing my house shortly after that. Feeling lost, lonely and abandoned, I had to start all over as a single parent. Depression and sadness overwhelmed me. The magic I felt since I was a little girl vanished. 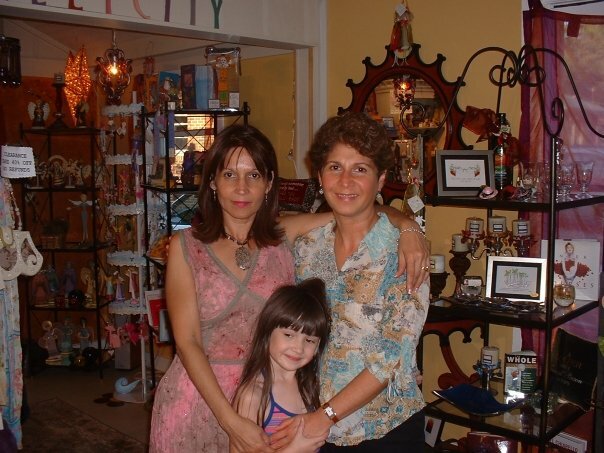 Longing to go home in 2012, I was able to spend New Year’s Eve in Puerto Rico. While I was there, my sadness miraculously disappeared through the incredible healing power of nature. A shift-aligned my mind with joy, realizing that the magic I thought I had lost had always been there, just like in those ancient trees. I fell in love again with my beautiful island, and when I came back to Atlanta, I decided to begin this blog. Writing about Puerto Rico has filled my journey with enchantment, adventure, romance, and magic. The more I learned about Borinken, the prouder I feel as a Boricua. I begin each day applying small rituals in my routine that would fill my life with joy and magic. Loneliness and sadness are no longer present in my emotional atmosphere, as I became aware that we have two choices in this short life: to be happy or unhappy. As a Latin woman, I love to dance, believing Puerto Ricans learn how to dance before learning how to walk. So instead of dwelling in worries, I discovered that the secret of feeling magic is in learning to let go. Once I was able to surrender my worries to a higher power, miracles continuously manifest in exciting and freeways. 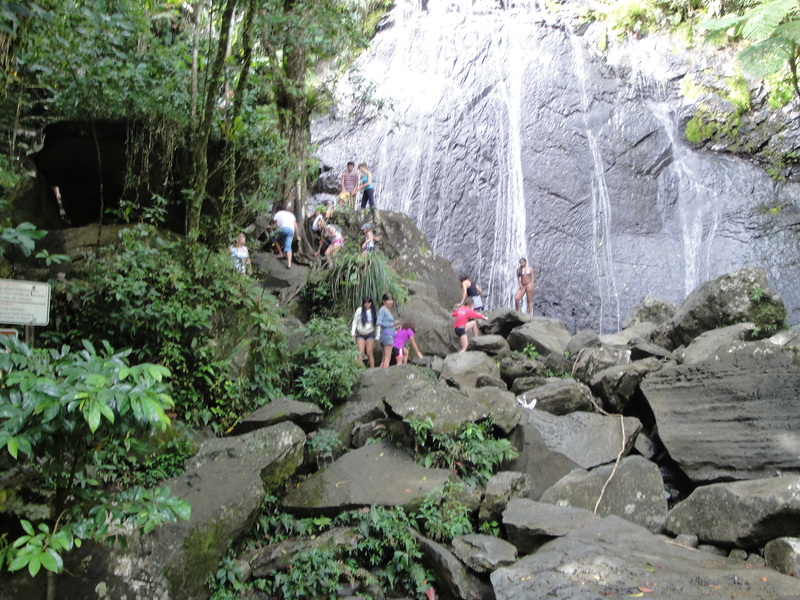 During my second trip to the Island of Enchantment this summer, I went back to El Yunque to indulge in the bewildering atmosphere of the rainforest. Divided into four regions of woodland: Tabonuco, Palo Colorado, Sierra Palm and the Dwarf Forest. From Palo Colorado Forest, I hiked with my daughter and nieces to La Mina Falls. Even though there is only one season in Puerto Rico, I noticed that the leaves turn red in Colorado Forest when they are about to fall, just like in autumn. Inhaling the fresh air that graciously floats between the fog, I exhaled, letting go to just be in that glorious moment. During the moderate hike of about 45 minutes, we passed a beautiful rushing river, canopied by a lush green vegetation and a steep pavement of rocks. We stopped at La Mina Falls, where the water cascades over a cliff into a pool. There were many people taking pictures and bathing in the cold waters. I heard someone wondering if those waters could have healing powers. I believe everything in El Yunque is magical and powerful, just like the Indian Taínos believed it is a sacred place because it was where Yocahú (their good god) and Atabey (the mother of nature) reigned. Because it was raining and slippery, my daughter and nieces decided to wait for me there while I headed to Sierra Palm Forest. When I reached Mt. Britton peak that is over 3,000 feet above sea level, amazed by the overwhelming sights from the observation tower. Becoming the official tree of El Yunque, the Sierra palm fruit is the primary source of food for the endangered and rarely seen Puerto Rican parrot. I continued my walk through the clouds, finding myself in the Dwarf Forest after hiking for another mile. Contemplating the fog moving in like a pearly white gauze, the rocky path, labyrinth of sweeping valleys and entangled vegetation seemed like another world. In this mystical land of stunted trees and uncertain climate, the woodland appears to establish communication with a universal intelligence. I sat alone in this mist-cloaked mysterious land for a while, noticing how the trees transform into distorted dwarfs. Submerged in that world of clouds, I heard the dwarfs laughing, dancing, and chanting secrets of wisdom, as if in front of an audience. Our indigenous ancestors communicated with the spirits that incarnated those old and mighty trees. Through the legacy of knowledge they left us and my connection with nature in Puerto Rico, Atabey became a guide, sharing with me principles that allowed me to create an exciting life, having Puerto Rico as a magical background. 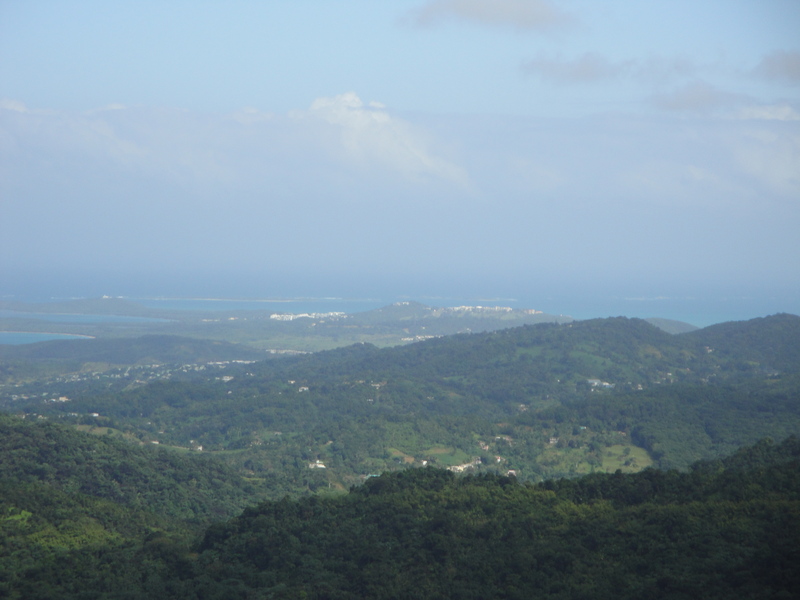 This entry was posted in The Tainos and tagged Atabey, big tree trail, colorado forest, dwarf forest, el toro peak, El Yunque, el yunque peak, hikes, Indian Taínos, Island of the Enchantment, la mina falls, Mt. britton, palo colorado forest, puerto rican parrot, Sierra Luquillo, sierra palm forest, Taínos, Tabonuco Forest, trade winds trail, yocahu. Bookmark the permalink. The first name the Indian Taínos gave to Puerto Rico. Yvette, the way you describe your surroundings, like only you can do, makes one feel as part of that moment as if one was there. Thank you Emily. Hope we can go one day together.